Julian Ashton was born at Addlestone, England and studied at the West London School of Art and the Academie Julian, Paris. He came to Australia in 1878 to work on the Illustrated Australian News in Melbourne, followed by the Australasian Sketcher. He moved to Sydney in 1883 to work on the 'Picturesque Atlas of Australasia' with other artists, including W C Piguenit, A H Fullwood, Frank Mahony, Marian Ellis Rowan and Tom Roberts. Ashton was a major influence on the teaching and appreciation of art in Sydney; he was founder of the Sydney (later Julian Ashton) Art School, President of the Art Society of NSW and a trustee of the AGNSW. 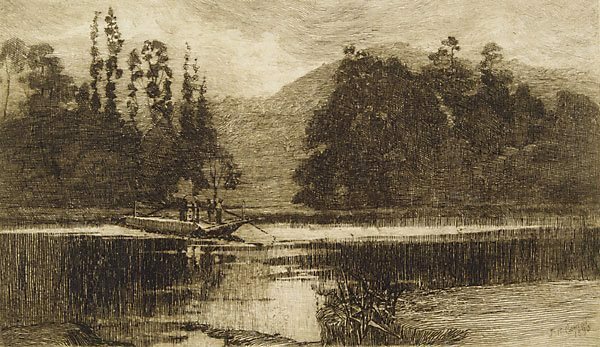 Best known as a painter in oil and watercolour, Ashton made seven etchings in 1893, having been introduced to the medium by Livingston Hopkins, whom he credited as having introduced etching to Australia in his autobiography 'Now came still evening on' (1941). Four etchings are in the Gallery's collection, purchased from Angus and Robertson, which published all but 'The ferry' in editions of 14, for sale at 10 guineas for the set of seven. A watercolour portrait by Ashton of Hopkins is also in the Gallery's collection. Signed and dated within plate to print l.r., "J R ASHTON/ 1893". Signed l.r., pencil "Julian Ashton. ".